What does the fox say? I don’t know – probably something charming & witty. 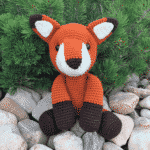 Keep him away from your hen house, because Fredric is as clever as he is cute! Be sure to read the Notes section at the bottom of the pattern before proceeding. The inner ears are worked in rows. Ch 1 and turn at the end of each row. Chains do not count as stitches. Ch 1, crochet up the side of the triangle, ch 2 at the top of the triangle and sc down the other side of the triangle. Fasten off and leave a long tail for sewing. Attach the inner ears to the ears (I opted to cut a short tail and weave it into the back of the work, then sewed the inner ears on with a standard needle and matching thread). Attach the nose to the head starting in the stitch marked with color 1, and in each of the next 6 stitches in the round. Stuff head ¾ full. 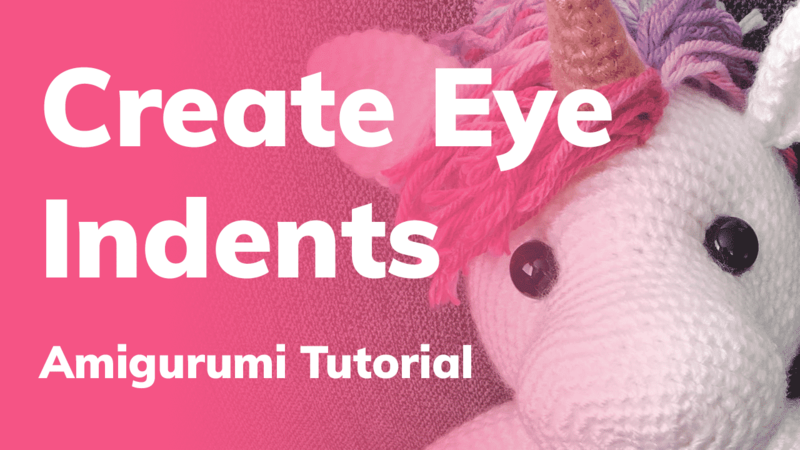 Next, create the indents for the eyes (see “How to indent the eyes” in the Notes section at the bottom of the pattern). Insert eyes and secure backings. Cut working yarn and close with an ultimate finish. Attach the ears to the head. 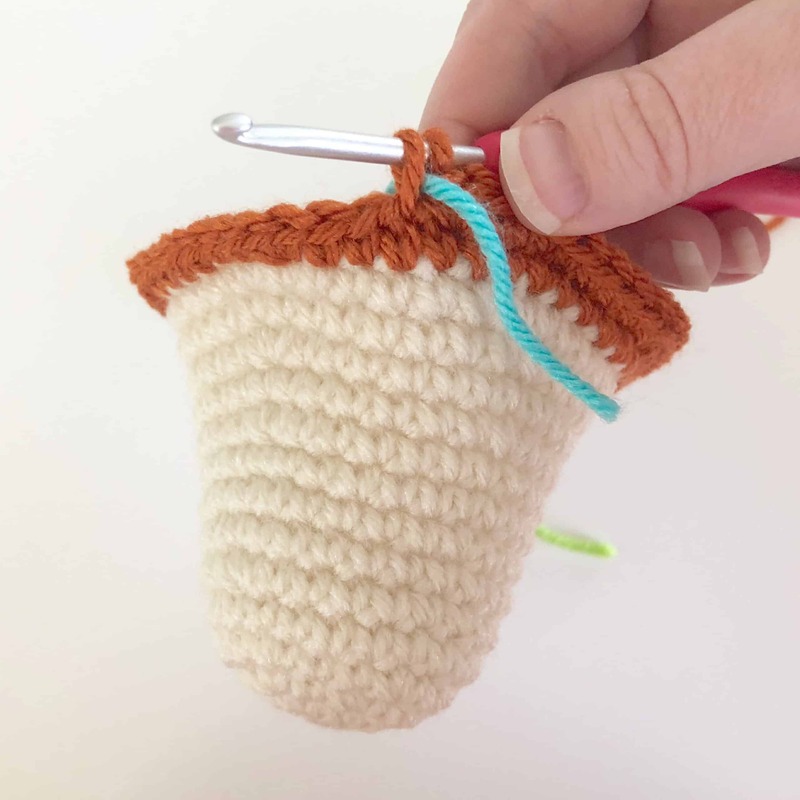 Start by attaching an ear to the left side of the head in the stitch marked with color 3 and the next 9 stitches in the round. Next, attach the other ear to the right side of the head starting in the stitch marked with color 3 and the previous 9 stitches in the round. Fasten off and leave a long tail for sewing. Stuff firmly with fiber fill, then attach the head to the body. Fasten off and leave a long tail for sewing. Stuff firmly with fiber fill, then fold the top opening in half and slip stitch closed. Finally, attach the legs to the body. Fasten off and leave a long tail for sewing. 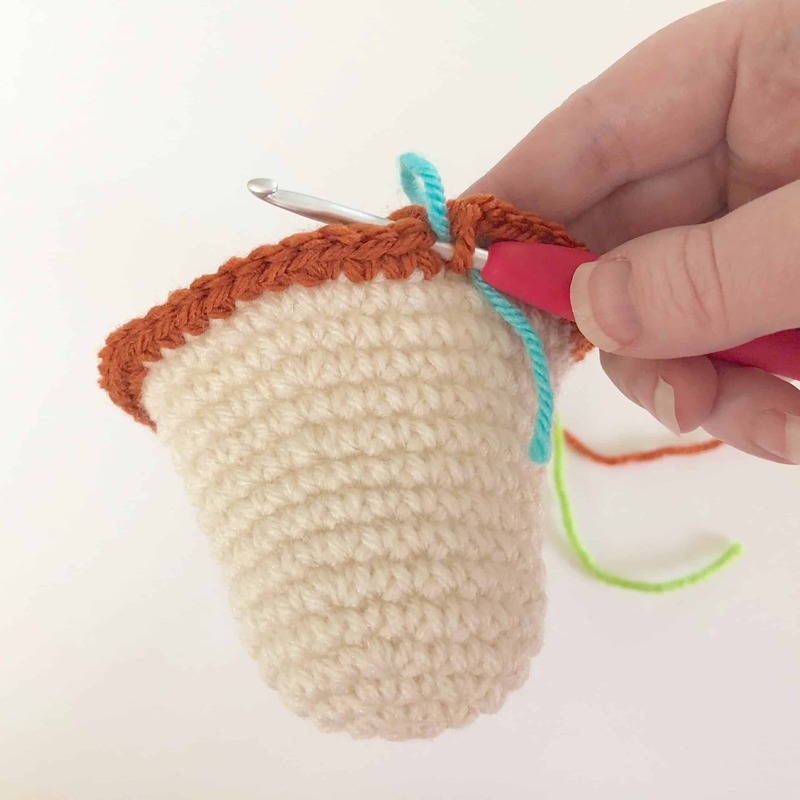 Stuff firmly with fiber fill, then fold the top opening in half and slip stitch closed. Finally, attach the arms to the body. Stuff firmly with fiber fill. Fasten off and leave a long tail for sewing. Finish stuffing, then fold the top opening in half and slip stitch closed. Attach the tail to the body. The pattern indicates to insert 5 different stitch markers in various places besides the one you use to track the beginning/end of each round. I recommend using strands of yarn in 4 different colors as your stitch markers: One strand in color 1 (purple) to mark where you will start attaching the nose, two strands in color 2 (blue) to mark where you will place each eye, two strands color 3 (pink) to mark where you will start attaching each ear, and one long strand in color 4 (green) to track the beginning/end of each round. 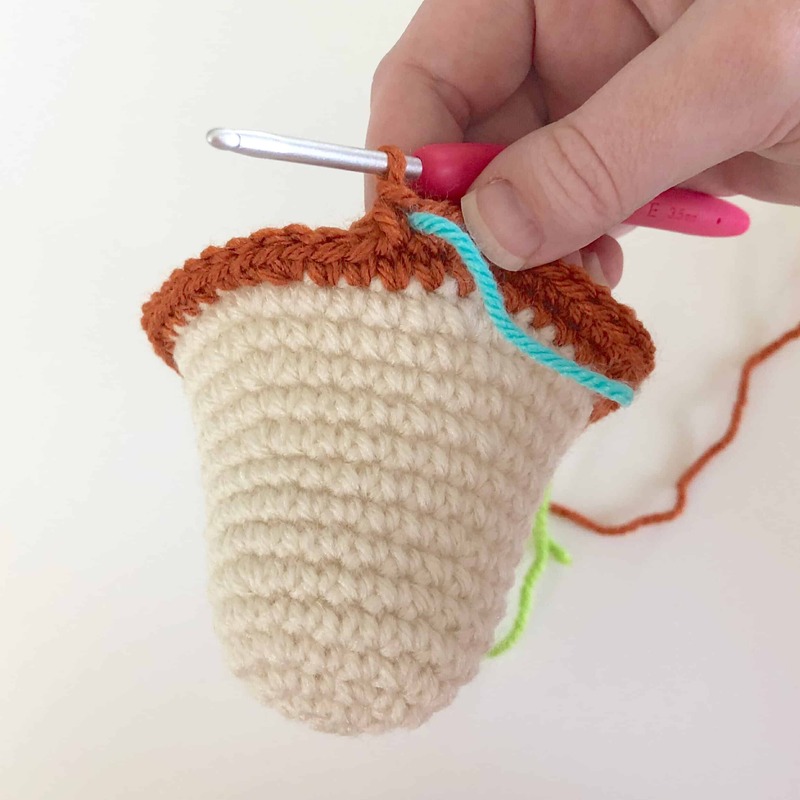 The photos above demonstrate how to mark a stitch while crocheting a round: lay your strand of yarn acting as a marker over your working yarn and the stitch you’ll be working into, then complete the stitch as normal. 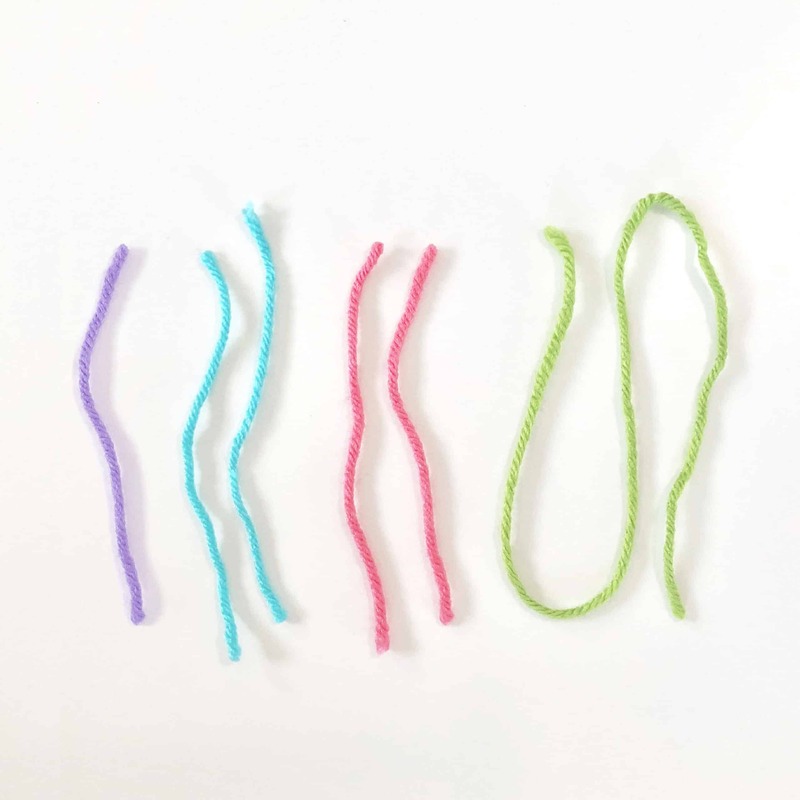 You’ll essentially be weaving the long strand in color 4 through your work with each round. On odd rounds you’ll be laying the strand back-to-front, and on even rounds you’ll be laying the strand front-to-back. Step 1 – Cut a strand of yarn approximately 18″ long. Tie a large, secure knot in one end and thread the other end through your yarn needle. Step 2 – Insert your needle through the back opening of the head and sew between the two spots where you’ll be placing your safety eyes (marked with your color 1 stitch markers).